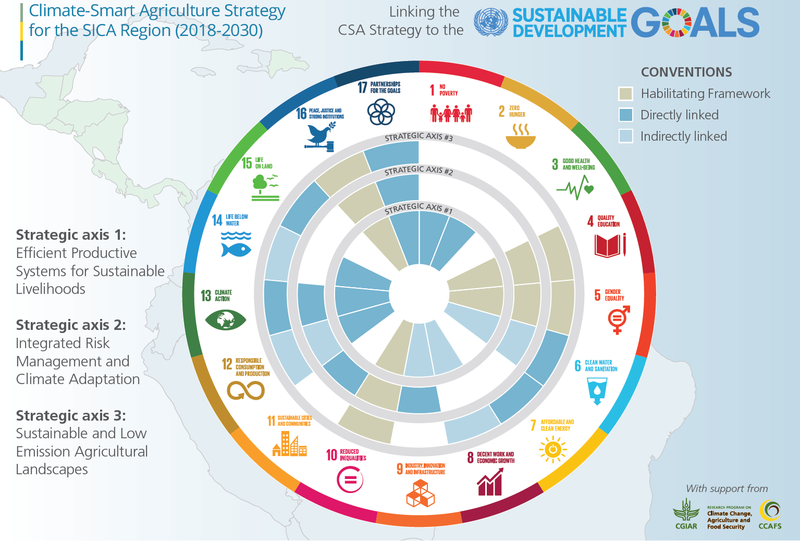 CCAFS Future Scenarios work informs the Central American Climate-Smart Agriculture Strategy that will make for a more competitive, inclusive, resilient and sustainable agri-food sector in the region. The Central American Integration System (SICA in Spanish) countries are about to experience a demographic boom that will leave them with the largest working-age population they have ever seen. SICA includes Belize, Costa Rica, Honduras, the Dominican Republic, Panama, Nicaragua, Guatemala, and El Salvador. It is a daunting task to ensure regional food security in one of the world's most climate-vulnerable regions while also bringing sustainable development and prosperity to rural areas. Agricultural sector transformations require increasing food system resilience, improving climate change adaptation and reducing disaster risks in a comprehensive and sustainable manner, while at the same time creating favorable conditions for young people to remain in rural areas. The Climate-Smart Agriculture Strategy for the SICA region was signed in June 2017 and represents a major step towards preparing the region for its changing demographics and uncertain future under climate change. The strategy contains key recommendations from a multi-stakeholder scenarios process conducted by the Central American Agricultural Council (CAC) in collaboration with the CGIAR Research Program on Climate Change, Agriculture and Food Security (CCAFS) Future Scenarios Project and the University for International Cooperation (UCI). The CAC, which is made up of the Ministries of Agriculture from the SICA countries, considers the strategy the main instrument in promoting a more competitive, inclusive, and sustainable agricultural sector that is adapted to climate change. The recommendations that resulted from the scenarios analysis at the center of this process highlight a long-term vision of more government support for investment and access to technology for small-scale producers; increased food production for the national and regional markets; and improvements in coordination and collaboration between SICA countries in the management of agro-climatic risks, production and trade of food, and water resource management. The recommendations also focus on protected areas and other environmental regulations to help protect water sources and other ecosystem services. What are future scenarios and why use them? A future scenarios process such as the one adopted during the development of the Climate-Smart Agriculture Strategy involves the participatory construction of imaginary but plausible and diverse scenarios. These are stories of the future told in words and images that show different plausible pathways of socio-economic, environmental and political development of the agri-food sector. The CAC Advisory Committee led the development of two positive and two negative future scenarios for Central America and the Dominican Republic in 2050. The scenarios were based on regional scenarios for agriculture, food security, environment and livelihoods up to 2050 and adapted during this process to the specific focus of the strategy: climate-smart agriculture (which also includes aspects such as risk management). Actors directly and indirectly linked to the governance of agriculture and livestock in the SICA region participated in the process, allowing for the generation of holistic, plausible and varied visions of the future that represented and included wide-ranging perspectives and eventualities. The exploration and analysis of these diverse futures and the uncertainties they exposed allowed participants to have a broad perspective on measures that would prepare the region for the challenges posed by each scenario. Recommendations were then made for improvements to the strategy that would increase its chance of success in the face of the challenges posed by each scenario. The strategy was then further bolstered by an online public review of the recommendations by approximately 836 actors in the agri-food sector from across the countries in the region. As the region veers into unchartered territory, with climate change and an explosion of the working age population presenting new and complex challenges, it is essential that policies are as robust as possible in the face of a future that is almost impossible to predict. The multi-stakeholder scenarios process used to analyse and improve the Climate-Smart Agriculture Strategy has been a major step in this direction. With the strategy officially launched to the public in October 2017 and concrete plans in the pipeline to trickle it down to national governments, there are high hopes for a more competitive, inclusive, resilient and sustainable agri-food sector. Although foresight processes such as future scenarios are increasingly used when trying to anticipate and plan for climate change, we are yet to understand the full extent of their benefits and challenges as policy interventions, particularly in the countries most vulnerable to climate change. The Re-imagining anticipatory climate governance in the world's vulnerable regions (RE-IMAGINE) project will build on the CCAFS Future Scenarios project to address such questions and investigate ways in which foresight approaches can play a role in appropriate and effective modes of anticipatory climate governance in the world’s most vulnerable regions, including the SICA region. Made possible by the BNP Paribas Foundation’s ‘Climate Action Call’, the project is led by Utrecht University’s Copernicus Institute for Sustainable Development with Wageningen University & Research, the University of Oxford and the CCAFS Future Scenarios Project as project partners. Interested in policies and priorities for climate-smart food systems? Subscribe to our newsletter to receive quarterly updates on our CCAFS work and occasional announcements. Charlotte Ballard is the Communications Officer for the RE-IMAGINE project, sister project of the CCAFS Scenarios Project, and is based at Utrecht University in the Netherlands. Marieke Veeger is a scenarios and policy researcher for the CGIAR Research Program on Climate Change Agriculture and Food Security (CCAFS) at the University for International Cooperation (UCI).